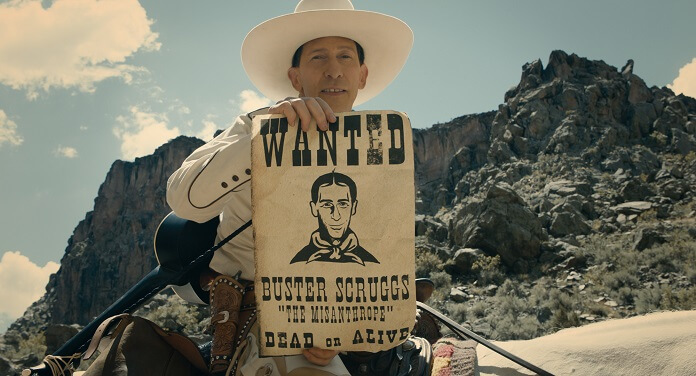 Hot off its Best Screenplay award win at the Venice Film Festival, Netflix has released the official trailer for The Ballad of Buster Scruggs. The latest film from Joel Coen and Ethan Coen will have a limited theatrical run beginning on November 16, 2018. It’ll launch simultaneously on Netflix. The Ballad of Buster Scruggs reunites the Coen brothers with one of their O Brother, Where Art Thou? stars, Tim Blake Nelson. The cast also includes Tyne Daly, James Franco, Brendan Gleeson, Bill Heck, Grainger Hines, Zoe Kazan, Harry Melling, Liam Neeson, Jonjo O’Neill, Chelcie Ross, Saul Rubinek, Tom Waits, Clancy Brown, Jefferson Mays, Stephen Root, and Willie Watson. Joel and Ethan Coen wrote, produced and directed the Western. Megan Ellison, Sue Naegle and Robert Graf served as producers. The Coen brothers’ behind the scenes team included director of photography Bruno Delbonnel, production designer Jess Gonchor, set decorator Nancy Haigh, and costume designer Mary Zophres, with music by Carter Burwell.